With bikini season upon us it’s time to crank that workout session into high gear. 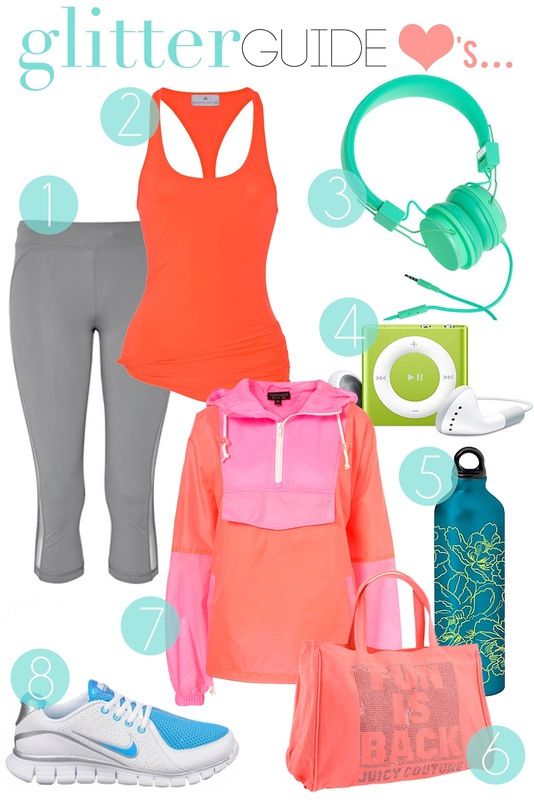 Having stylish activewear is a great motivator and a perfect way to try the bright color trend. Also try fun accessories —like a quirky tote and retro headphones. *With fitness on my brain this weekend I couldn't help but post this. Have a happy and healthy weekend! Love all the color blocking! Coral and turq...no fail combo! omg i want everything from the adidas by stella mccartney line! I actually feel like exercising after looking at this look. Love the modcloth earphones in the neon green. I love all of this bright, cheery activewear! Perfect motivation. So cute! I am excited for the glitter guide! i love the stella mccartney line for adidas! have a great vacation! Nothing like "happy" colours to lift up the spirit! Great pics! oo great waterbottle! i need a new one after discovering my one from starbucks leaks..
also, just wanted to say you hugely inspired me with this post http://www.sterlingstyle.net/2011/05/easy-breezy.html as i went straight out & bought this very similar t-shirt from h&m, which i would definitely have never picked up previously as i wouldn't have been sure how to wear the shape, but i love how you tucked it in at the front..
i like these picks a lot. and i should get better at working out again. And yes, it's time to get ready for Summer! I definitely need to add some color to my workout wear. I love that jacket. Love these bright, colorful picks! I so need motivation to work out right now! good looking workout clothes always help me getting more motivation..thank you for those tips.